MONTREAL -- It was quite surreal. There was Vincent Lecavalier, strolling into a ballroom at the Fairmont Hotel, ready to face the music and squelch the trade rumors in the very city to which the rumor mill has him being traded. Vincent Lecavalier doesn't feel a player should be obligated to come to the NHL All-Star Game if he's hurting or injured. The question was raised following the recent All-Star Game withdrawals by Detroit's Nicklas Lidstrom and Pavel Datsyuk in the West and Pittsburgh's Sidney Crosby in the East. "I think when you look at some guys not here, like Nicklas Lidstrom, who went to the All-Star Game so many times, loves the game and who wants to promote the game, you can't really judge," Lecavalier said. "I really think the guys that are here, really want to come over. If guys cancel at the last second, then they must have an injury or something happened with their families. It's an honor to be here and I believe every guy wants to come." Lecavalier does admit most players around the League are hurting in some way by this time of the season. "In January or February, everyone is bruised up and lot of guys have injuries, but still play through them," he said. "If guys have been playing through injuries, it might be a better idea to take a few days off and make sure that they're ready for the second half of the season. I think people should understand that and I believe the guys really want to be here, but there are a lot of things that happen during the season that sometimes getting 4-5 days off will help you and your team in the long run." Lecavalier, the veteran captain of the Tampa Bay Lightning, knew he would be bombarded with questions surrounding the trade rumors to the Canadiens that surfaced earlier this month. He stood behind the podium and addressed the situation head-on. 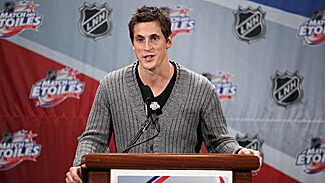 "Management told me nothing is happening -- and if there was, they would come to me," Lecavalier said. "If it did happen, that I was going to be sent to Montreal, I can say that I grew up here (in Ile Bizard) and have always loved the Montreal Canadiens. It's a great organization, and I have a lot of family and friends here. I think a lot of Montreal players would tell you it's a dream place to play." Lecavalier, who helped create a charitable program called Kane's 4 Kids that benefits All Children's Hospital in St. Petersburg, Fla., actually spends his off-season in Montreal. "I don't know if anything will happen because you can't predict the future," he said. "If it happened, it happened, but, like I've said before, I love being in Tampa Bay. The coaching staff is great, the players are great and I really enjoy being there." The rumors actually surfaced just as the Lightning were completing a western road swing from Jan. 8-13. "I was getting a lot of phone calls from parents, family and friends, but they were all just rumors and, as I said, if something were going to happen, (management) would come up to me and ask me to come up with a list or something like that," Lecavalier said. "It's basically what you guys know; nothing new." At the time of the published rumors, Tampa Bay General Manager Brian Lawton vehemently denied the reports. "To suggest we're engaging in conversations to trade him or we're shopping him to all teams in the NHL is completely inaccurate," Lawton said. "It's false, egregious and it's abusive toward the player. I can tell you if a player of that stature were ever going to be traded, I would go meet with him, face to face, and discuss the situation and that has never happened." Lecavalier feels it makes no difference where you play in today's NHL; there's always pressure to perform. "There's pressure in Tampa and there's pressure in the NHL on any hockey team," he said. "I like to put pressure on myself to do the best that I can, to play to the best of my ability. You're paid to play hockey and this is a great sport, but there's pressure that comes with it and I don't think it changes from one state to the next." Lecavalier has certainly backed up his assessment. Since the time the trade rumors surfaced, he's posted 4 goals and 2 assists over his team's final four games before the All-Star break, an obvious sign the 28-year-old center actually enjoys the spotlight, particularly when he's back in the city where it all began for him. "Obviously, in a city like Montreal, where hockey is a religion, some might say there's a little added pressure," Lecavalier said. "There's also a lot more media attention, but that motivates me as well. Every time I come here to play, or even in Toronto, it really motivates me when I'm on the ice, so that's very exciting." Lecavalier, while realizing he needed to discuss those trade rumors for now, is ecstatic to be back in Montreal to participate in his fourth NHL All-Star Game on Sunday. "I kind of had a feeling a few people would tell me what to expect, but to tell you the truth, when I got out here (on Thursday) and saw the fans, it was great," Lecavalier said. "I didn't really know what to expect, but when I walked through those doors and saw the hundreds of people there for autographs and waiting for the players to arrive, I was so excited. My hair was all over the place, and I really didn't expect to have a welcome like that." Lecavalier, who has 9 goals and 17 points in his last 12 games, leads the team in goals (21), power-play goals (6), game-winners (5) and shots on goal (170). He's also second to linemate Martin St. Louis (17 goals, 46 points) with 44 points. "Being from Montreal, I know there's a history behind the Canadiens and all the Stanley Cups they have won," he said. "Everyone loves the Canadiens, and for someone born here to actually play here is a great honor. There's some pressure, but it's good pressure. This is a great town and the people love their Canadiens and that's what makes it really fun."